For the past several years I have been witness to a craft beer phenomenon happening right here in Sonoma County. It all started with a beer called Pliny the Elder. This Double India Pale Ale is known all over the world for its bold hop and malt flavors that people can’t get enough of. Now we have the successor to Pliny the Elder, Pliny the Younger is a Triple India Pale Ale, even bigger and bolder in flavors and aroma and has won the hearts of many more Pliny lovers. Vinnie Cilurzo brewer and co-owner, with wife Natalie, of Russian River Brewing Company, was very generous in sharing information with me about this year’s Pliny the Younger. With Vinnie’s help I was able to formulate my own homebrew version of this beer. Since I have access to most of the same ingredients I thought it would be fun to give this famous beer a shot! Pliny the Younger is served just once a year in Sonoma County. People line up around the block to get the chance to taste it. If you can’t stand to wait a year for this beer, give this recipe a try. 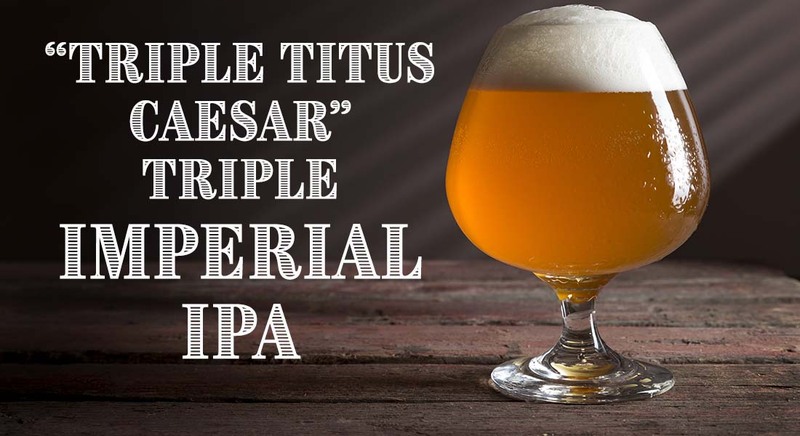 I’m calling mine Triple Titus Caesar. Don’t think of it as a clone, just think of it as a beer that is honoring a member of its style family. Just as the Roman Pliny the Younger honored the memory of his adopted father Pliny the Elder upon his death in 79 AD. (The same year Titus Caesar became Emperor of Rome!) Vinnie brought us both the Plinys, we bring you the successor-- Titus! Golden amber in color with bold citrus, pine and grapefruit aromas, the lupulin rush begins, followed by equally exciting grapefruit and sweet piney flavors. Meanwhile rich malt flavors play their part to achieve a beautifully balanced big bold brew.